It’s Time to Make Food Fun Again. It’s Time to Make Food Fun Again! Release the Fear of Food. I remember the day that I stood inside of Whole Foods Market, CRYING. A few months before I had just been diagnosed with cancer and I had been put on a very strict diet. I was angry. I was depressed. I was frustrated. What could I eat, that wouldn’t eventually kill me? This was my ultimate low. I had reached rock bottom. I had read about all the diets; vegan, keto, paleo, whole 30, you name it. They all just feel restrictive and divisive. I had watched the food documentaries and they just instilled more fear and frustration. I was at the point that I just wanted to eat salad and drink water. Food was no longer fun for me. After over 2 years of not wanting to cook, being scared to enjoy the foods that I loved, reading article after article about “healthy eating” , I had reached my breaking point. I knew that taking that approach to eating was not only unsustainable, but equally as important, not enjoyable. I remember the day that I decided that I was going to enjoy food, the way I was meant to, without fear and without frustration. It was freeing, liberating, if I’m being honest, and a true turning point for me. That when I decided to Re-Invent Eat Out at Home University. I knew that if I had felt frustrated about trying to balance being healthy with eating great food, other’s might have too. It’s about being INFORMED, not AFRAID. Making food fun again is not all about eating cupcakes and donuts. It’s about understanding how food works, how food is made and how your body responds. You and I both know that diets don’t work, but healthy lifestyle changes do. Inside of Eat Out at Home University, you will learn how to create your own personalized healthy eating game plan. The only diet that works is the one that you will actually stick to. There is a time and a place for donuts and you get to decide when that is. You pick the rules. The goal is to make informed choices when it comes to your food, not fear based ones. It’s time to get back in the kitchen. The truth is healthy eating starts at home. Having fun with food starts in your own kitchen. Food is best when it it shared with the ones you love. Enjoying something Gourmet Everyday starts by exploring new ingredients. They were meant to coexist. When you get back in the kitchen, that is when you will discover that. Eat Out at Home University will show you how to bring the two together, effortlessly. That's why I created Eat Out at Home University. What is Eat Out at Home University? Eat Out at Home University is the place to learn how to become a better cook, for yourself, for your family, friends, and just for fun! It is a 12 month online cooking coaching program to help you bring the Fun back to Food. It’s the place to learn how to make valuable connections and lasting memories through food. It's for foodies and families who want to learn how to Cook Better, Eat Together and Enjoy Gourmet Everyday. It's all of best parts of culinary school, minus the student loans, uniforms, late nights, text books and homework. I started cooking when I was 6 years old. At least that is as early as I can remember. For the first 5 years of my life, my mother, father and I would go to my Grandmother’s house every Sunday for dinner. By the time I was 12 I cooked my first Thanksgiving dinner for my family all by myself. (Well, I had my grandma looking over my shoulder, but still, I did the cooking.) In high school and in college and I would cook for my friends and their dates. Through my cooking I’ve even helped a few people get married (and have babies) along the way. I remember sitting and watching cooking shows with my grandmother when I was in middle school and high school and being in awe that people got to cook for a living. My grandmother was an amazing cook. I remember coming home from college and she would make enough food to feed an army and it would just be the two of us. I love that memory. I remember the feeling when she would have the entire family over for dinner and the food would be amazing. I also remember when she would sell dinners from her little apartment to people in the neighborhood and she would always sell out. People loved her cooking and they loved her. When other people tried to copy what she was doing, they always asked if my grandmother was the one who cooked it and if it wasn’t her, they didn’t buy. That’s when I really saw what it’s like to bring people together over food. It’s always a good time. I wanted to be able to do that. After years of working in corporate america as an Engineer and cooking on the side, I decided to go to culinary school. To be honest, I already knew how to cook when I went to culinary school, but I wanted to be even better. I just really enjoyed feeding my friends and family and I didn’t just want to be good, I wanted to be great. And while I thought I was a good cook, I soon realized there was so much more to learn, so many new things to try. It was one of the best decisions I have ever made. Since that time, I’ve had the pleasure of cooking for Sheryl Crow, Bishop T.D Jakes, Giada DeLaurentis and Sarah Jakes Roberts. I have had the opportunity to assist celebrity chefs such as Mario Batali, Guy Fieri of the Food Network, Martin Yan of Yan Can Cook and Art Smith who was Oprah’s private chef. I’ve been a caterer, a personal chef, pastry chef, and cooking school manager among many other things. I’ve taught thousands of people how to cook (in real life and online) and it’s my absolute favorite thing to do. Who would have thought that food could have done all of that? One thing that I have learned from years of cooking, is that FOOD HEALS. I’ve seen it heal families, I’ve seen it heal relationships and I’ve seen it heal the human body. Food brings us together and makes delicious memories. What happens over those meals is what we remember, and that is what’s most important. The BENEFITS of Cooking & Eating at Home. Connection happens through conversation. In the past, the average dinner time used to be 90 minutes. Now it’s just 12. Real connection can’t happen in 12 minutes a day. Wouldn’t it be nice for you to have your family all sit down for a great meal or invite friends over for a dinner party? Introduces you to New Foods. There is something about cooking at home that makes you want to try new foods and explore new cuisines. There’s nothing better than introducing your loved ones to new dishes that become family favorites. One of the best things about really knowing how to cook is having variety at your finger tips. When you learn to cook at home, you can Eat Gourmet Everyday! Helps you to be Healthier. Healthy Eating starts at Home. 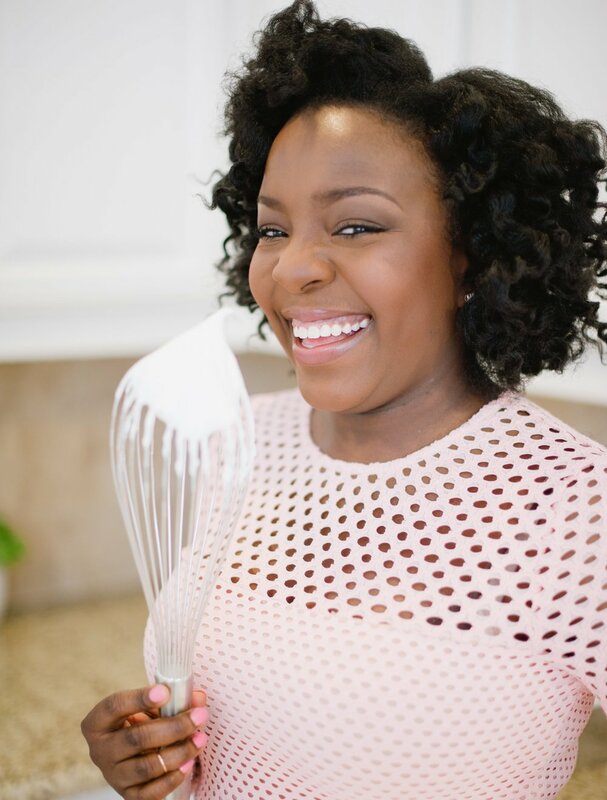 Did you know that when you cook at home and when you cook with children, over time you become healthier eaters because you can see and control what goes into your food? Children become more curious and open to trying healthier foods like fruits and vegetables. Healthy eating no longer seems restrictive/boring and becomes more creative and fun. You Become a Better Cook. When you are equipped with the right culinary skills it gives you the Confidence to cook anything and allows you to entertain with ease. No more being frustrated that a recipe didn’t turn out right or annoyed that you are eating the same things over and over again. Imagine being able to go into any kitchen, open up any cabinet and create something delicious. Knowing about how food works, and how to cook different types of cuisines, keeps food fun and interesting. Several studies have shown that students perform significantly better in school when they eat together with their family most days of the week. If it works, for students, then it will work for you. Cooking exercises both the creative and scientific sides of the brain. Do I really need to explain this one to you? You know it’s true. Just think about how you can spend $10 at Chipotle and $15 at Panera in 1 day. Versus how far that same $25 worth of groceries would have lasted you for 3-4 days. And that’s just for one person. Multiply it times the number of people in your house and well…. you can do the math. Did you know that it is 325% more expensive to eat out than to cook at home. Cost of an average meal at home is $4 vs $13 out. On average, you can save up to $5,800 a year (per person) by cooking and eating at home. You can always make more money, but you can’t make more time. Wouldn’t you rather spend the time laughing and connecting with your family and friends while cooking and eating a delicious meal together, versus waiting in the drive through at Chick-fil-a. The Eat Out At Home University is built around three frameworks: INFORMATION, INSPIRATION & APPLICATION. Okay, so what does that mean exactly? I'm glad you asked. Eat Out at Home University will provide you with information in the form of "How To" videos that help you understand ingredients, how to apply proper cooking techniques to different foods, how to pair foods well together, and how to know what seasoning go best on what foods. The recipes serve as inspiration so that you can experiment with along the way. You will learn how to put menus together and have a library of inspiration for when you entertain at home. The Live Cooking Classes is where you get a chance to see everything you've learned applied in real time. It also gives you a chance to re-watch over and over again so that you can cook along. 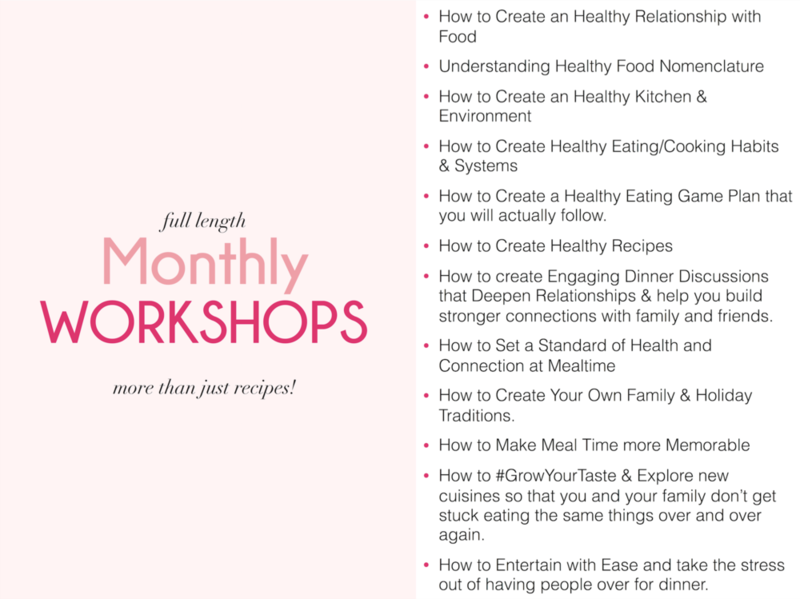 The workshops is where you will learn how to create a healthy lifestyle, bond with your friends and family and entertain with ease. Every month, you will receive a new COOKING TECHNIQUE MODULE. Each module will cover a specify topic or technique. 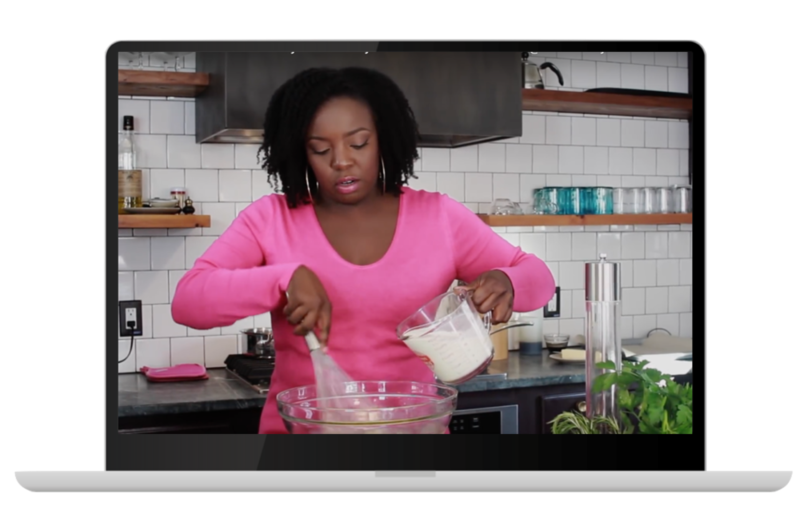 The monthly modules are filled with videos, recipes, and informational documents to help you master the art of cooking. Each month inside of Eat Out at Home University, you will receive a full themed menu with tested recipes that I have personally curated. This is a great way for you to try new cuisines and dishes from around the world to keep you out of a recipe rut. This is where you will learn to add some Gourmet to Your Everyday! Inside of Eat Out At Home University there will be a LIVE COOKING CLASS each a month. 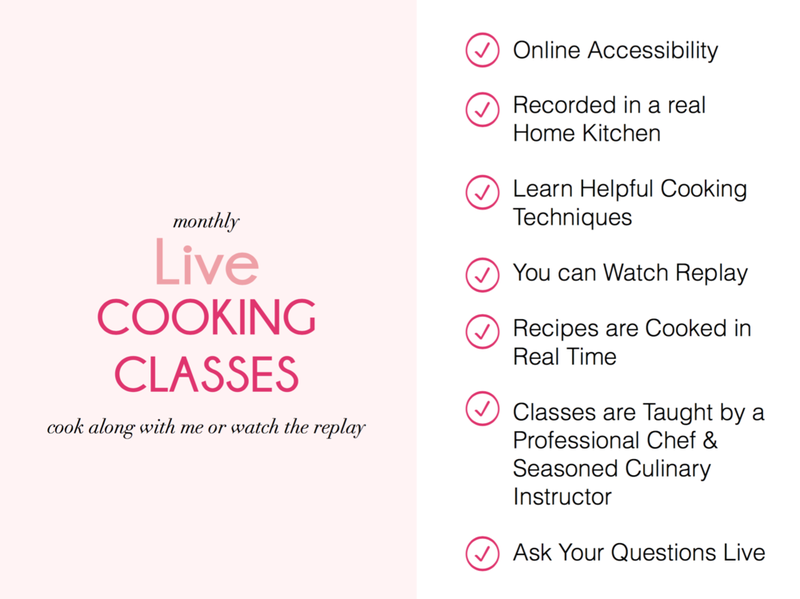 The classes will be live so that you will be able to see recipes made in real time, get a deeper understanding of the techniques demonstrated, cook along and ask all of your questions. Inside of Eat Out At Home University there will be a Full WORKSHOP each a month. You will learn more than just about how to cook. You will learn how food works and how to create a healthy lifestyle with your family beyond the kitchen table. Inside of Eat Out At Home University there will be a 60 minute LIVE Q&A coaching call each a month. This is your opportunity to ask questions about what you have learned in the monthly workshops, cooking technique modules and any questions about the recipes. 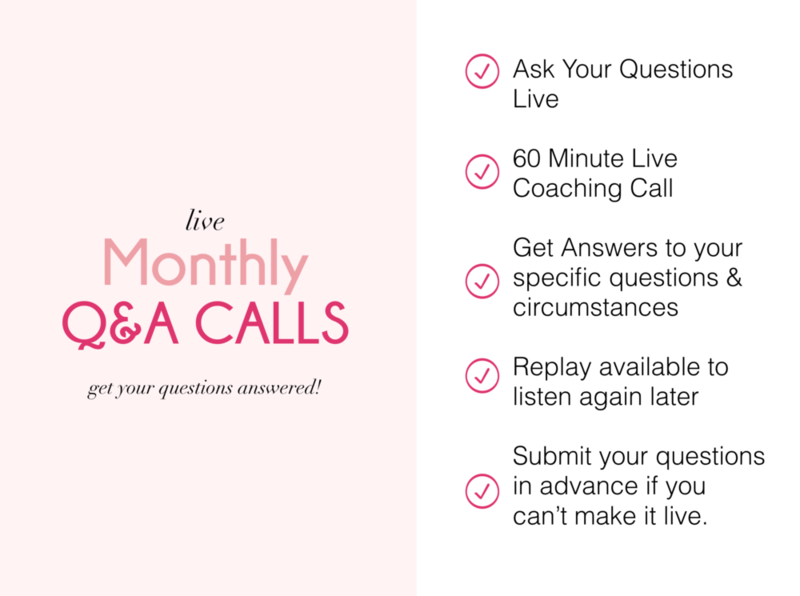 No questions go unanswered, and you can submit your question in advance if you can’t make the call Live. Replays off the calls will always be available. Food Lovers, Foodies, & Food Enthusiasts. People who want to eat healthier. People who rather pay a FARMER than a PHARMACIST. People who know that healthy eating starts AT HOME. People who want to be better cooks. People who are open to trying new foods and new cuisines. People who love connecting with their friends and family over a good meal. People who think cooking is a chore. People who rather take medication than eat vegetables and drink water. People who don’t want to improve their diet. People who don’t want to spend money on quality food. People who think eating is just for survival. People who like to eat the same thing over and over again. People who prefer fast food over home cooked meals. People who are SUPER PICKEY eaters. People who don’t like cooking for others. People who rather eat alone. People who have already been to culinary school or are professional chefs. Cooking has always been about CONNECTION, not just another chore. It’s time to learn the art and the pleasure of cooking. It’s time to sharpen our skills and learn how to cook…better. Maybe you want to learn how to cook to bring your family back to the table, or you want to learn how to cook because you are newly married and want to cook for your spouse. Maybe you are a new parent and you want to start your own traditions of eating together as a family. Or maybe you want to learn how to cook so that you can have people over and entertain your family and friends with a great meal. Maybe you want to learn how to cook so that you can eat healthier without being bored to death by bland food. Whichever reason is yours, it’s time to get back into the kitchen. Don't you miss sitting around the dinner table with your family? Or don’t you hate it when you’re out with friends and everyone is on their phones? Don’t you miss Sunday dinners and just laughing and having a good time with family and friends over a good meal? Don’t get me wrong. I enjoy eating but everything is take out, delivery, uber eats and postmates. What happened to cooking together and everyone hanging out in the kitchen? What happened to family potlucks, friendsgiving and backyard bbq's? Those were the most fun! Those things stopped when we stopped cooking. The average dinner time used to be 90 minutes. Now it’s just 12. True connection can not happen in 12 minutes. Think about how much we are missing out on, what's not being said and what's not being shared from those missing 78 minutes. Inside of Eat Out at Home University, you will learn how to connect over cooking, the way is was always intended to be. Because at the end of the day, what happens at the dinner table, is more important than what’s on it. Meals feed the body, but mealtime feeds relationships. Ready to Get Started? Click the button to enroll now.